Not one of the most famous women from the bible is our Debbie. But definitely one of the boldest. Certainly one of the bravest. God had given Deborah, along with all the other judges, the task of driving out and destroying all the current inhabitants of the Promised Land, in case they led the people away from God. The reason they needed 14 of these judges, was because everyone kept failing. Over a period of 355 years, God forgave the Israelites and gave them a new judge FOURTEEN times. So in Chapter 4, it’s Deborah’s turn and they’re facing an army led by a bloke called Sisera. Deborah’s army chief was called Barak. Although he is named in the Hebrews 11 ‘Hall of Faith’, this is not his finest hour. God had told Deborah that He would grant her army victory in a place called the River Kishon, which was a large flat terrain. Sisera’s army was much bigger than Barak’s and they even had chariots, which are designed for flat terrain. So, understandably, Barak is questioning God’s military strategy here! They’ve been commanded to fight Sisera’s army in a place that gave Sisera a significant advantage… so Barak has a bit of a tantrum and says he won’t go to battle unless Deborah goes with him. I'm not sure whether he wants her to see first-hand that it was a bad strategy, or whether he just wants her to hold his hand, but Barak is being pretty weak here. Spoiler alert: Everything God had promised came to pass. The flat terrain became muddy and the chariots got stuck so Barak’s army won. Sisera ran away on foot and came to a very sticky end at the hands of a mystery woman! No, Deborah responds by praising the One who went ahead of them and orchestrated their victory. She sings with Barak a joyful song of praise and gratitude to the Lord. 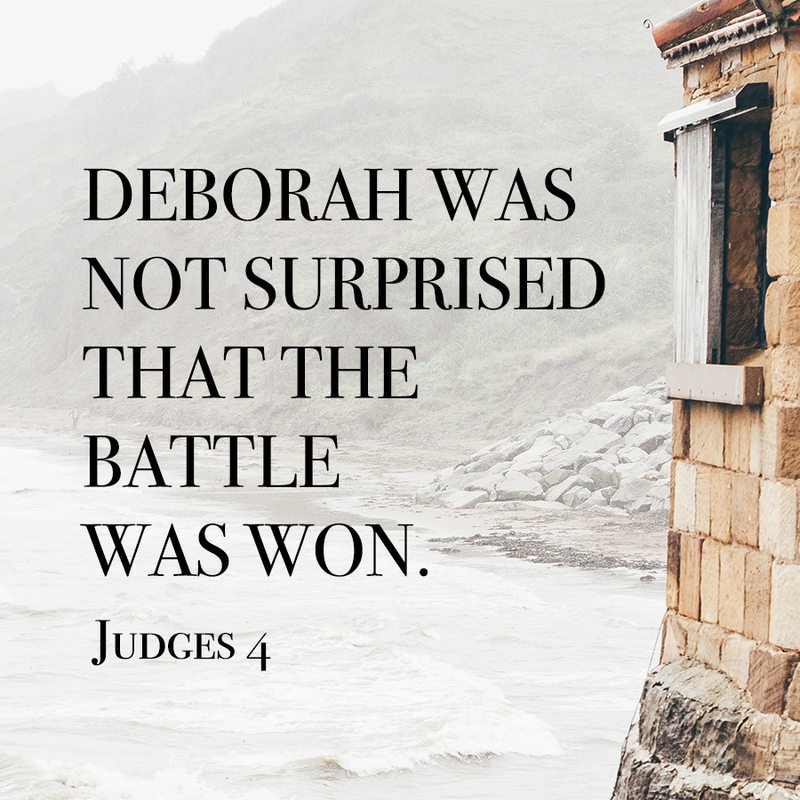 Deborah was not surprised that they won the battle, she knew that God’s ways are higher than our ways. Deborah knew that God chooses ways we would never have thought would work. And He does this time and time again, so that we remember it was God who orchestrated it. Barak looked at the situation with logic and details, unable to calculate a victory based on his understanding of military warfare. Deborah looked at the situation with faith in a sovereign Lord who can work all things for his glory, regardless of the details. Now I don’t think many of you are military leaders, but isn’t this true for our lives each and every day? Whether it’s in the way we approach long-distance relationships, busy schedules, that friend who hates all things Christian, reading the bible with dyslexia, the new girl at church who doesn’t speak English, or keeping in touch with friends when you move home… All these things seem logically very difficult, if not impossible. Without a sovereign Lord who can orchestrate the most spectacular of victories, it would be daunting to approach these battles. I pray that through this series, we will see more clearly and personally, that we have a God who goes before us and defies logic to keep us safe, and enable us to be both bold and brave for the glory of the Lord. Originally from Cambridge, Abby graduated in Psychology from Sheffield University. After spending some time in the States studying biblical counselling with CCEF, Abby is hoping to pursue a doctorate in Clinical Psychology! After becoming a Christian at 20 years old, she has loved getting more involved with More Precious ever since and seeing the fruit of its ministry!